DICE: "There are signature multiplayer elements that we want to bring into single-player." 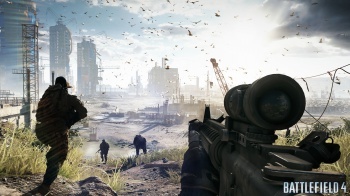 While Battlefield 3 may have been well received for its multiplayer mayhem, its single-player campaign was a black mark on the franchise. The narrow corridors and heavily-scripted levels felt anemic of choice, as if it had been drained by a volition vampire. Instead of giving up, developer DICE wants to make things right for its next title. To wit, Battlefield 4's single-player campaign will open things up a bit, allowing for more tactical choice and variety. Speaking to Official Playstation Magazine U.K., DICE General Manager Karl-Magnus Troedsson talked about the improvements. "There are signature multiplayer elements that we want to bring into single-player," he explains. "We want to give the player a choice. Do they want to go for the sneaky approach with a sniper rifle and a silenced pistol, or do they want to take a jeep and have the entire squad shoot at everything they see?" It seems that the two main elements that it's borrowing from multiplayer are open environments and team work. Instead of cramped hallways, it will include sprawling fields. To better use that space, players will also be able to order AI squadmates about, to flank a position or draw fire, for example. Battlefield 4 will launch on October 29th for PC, Playstation 3, and Xbox 360, with a release for Playstation 4 and Xbox One later this year. Source: Official Playstation Magazine U.K.